Hi lovelies! If you're anything like me, you looooove the smell of suntan oil. And by suntan oil, I mean Hawaiian Tropic, with no SPF or anything. I love that stuff. I used to put it on over sunscreen just because I love how it smells. I think I have like 3 bottles of it lol! Well I got a genius idea the other day, and I must admit, I'm quite proud of myself! Click to read more! If you'd like to make little flags for the skewers, do so now! I ripped off a bit of washi tape, folded it over the top of the skewer and cut the edges to look like a flag. Pour your oil into the vases; I filled them about 2/3 full. Add your skewers, pointy side down and flags up! 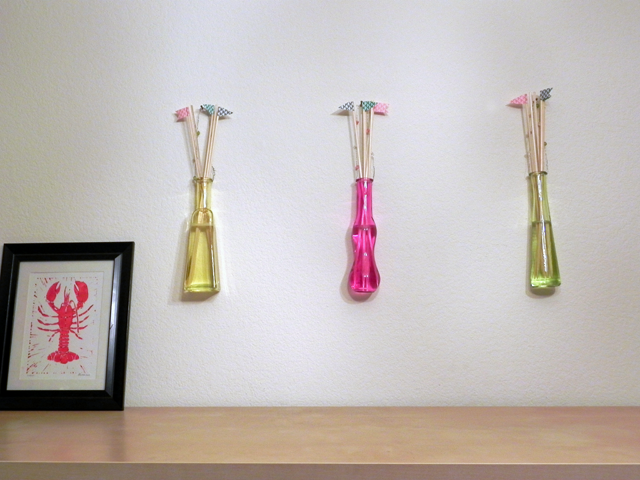 Hang them up, and voila! It's not too overpowering, and it's made my place smell subtly absolutely amazing! Now get scrounging around your place and find these items so you can make one (or three!) for yourself!